Napoleon Bonaparte Autograph Letter Signed. Rare autograph letter boldly signed by French Emperor Napoleon Bonaparte. One page, dated 25th May 1808, the letter is from the Prince de Neuchatel to Napoleon Bonaparte requesting permission to retire the Chaplain of the regiment of the Portuguese cavalry, due to illness. 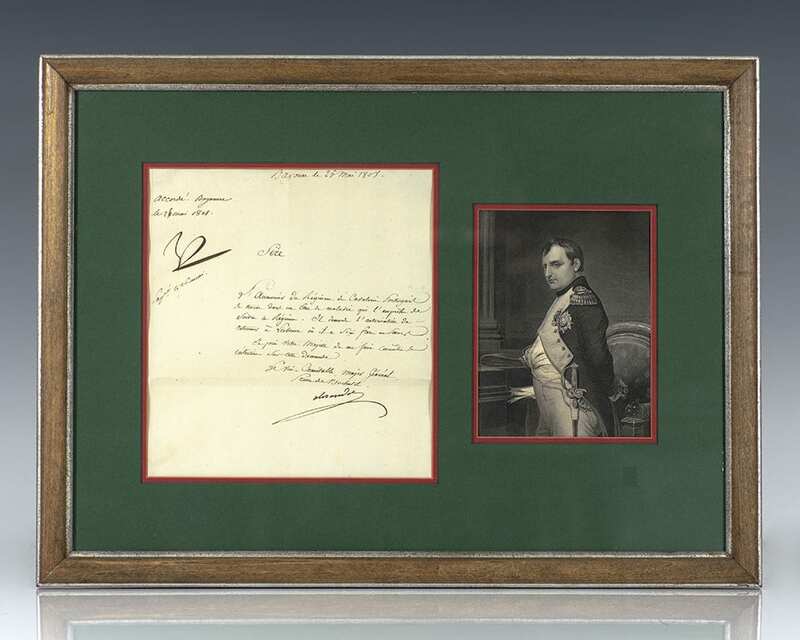 Boldly signed and granted by Napoleon Bonaparte in the upper left corner of the letter, “NP Accorde.” Double matted and framed with an engraved portrait of Bonaparte. The entire piece measures 19.5 inches by 14.5 inches. In fine condition. Rare and desirable. Napoleon Bonaparte was a French military and political leader who rose to prominence during the French Revolution and led several successful campaigns during the Revolutionary Wars. As Napoleon I, he was Emperor of the French from 1804 until 1814, and again in 1815. Napoleon dominated European and global affairs for more than a decade while leading France against a series of coalitions in the Napoleonic Wars. He won most of these wars and the vast majority of his battles, building a large empire that ruled over continental Europe before its final collapse in 1815. One of the greatest commanders in history, his wars and campaigns are studied at military schools worldwide. He also remains one of the most celebrated and controversial political figures in human history.